In the aftermath of Judgment Day and the takeover by the machines, John Connor (Christian Bale, The Dark Knight), the destined leader of the human resistance, must counter Skynet's devastating plan to terminate mankind. As Connor rallies his underground street fighters for a last, desperate battle, he realises that to save the future he must rescue his own father, Kyle Reese (Anton Yelchin, Star Trek). But the most shocking discovery co.. The mother of all destiny. Her son, the future leader of mankind. Their protector, a Terminator from the future. Together they must take back the future as Sarah Connor ('300's' Lena Headey) prepares her son to fight the war against machines determined to annihilate the human race. The clock is ticking. Can they stop Judgment Day? Episodes Pilot Gnothi Seauton The Turk Heavy Metal Queen's Gambit Dungeons & Dragons The Demon Hand Vick's..
Own Terminator - The Sarah Connor Chronicles Season 1 DVD from Deff, DVD, Blu-Ray & 4K Video Specialists - Free UK Delivery.. The hunt is on in a season of powerful revelations, breathless pursuits and bravura effects. A mysterious 3-dot symbol (do UFOs provide a clue? ), a girlfriend for John (is Cameron jealous? ), ZeiraCorp (can it master the renegade software called Turk?) - Season 2's 5-disc action arsenal is locked, loaded, ready to amaze. Episodes Samson and Delilah Automatic for the People The Mousetrap Allison from Palmdale Goodbye to All That The Towe.. Mother of all destiny Sarah Connor (300's Lena Headey) prepares her 16-year-old son John to become the leader of the human resistance in the war against machines. With help from a Terminator from the future, mother and son must outsmart and outfight deadly cyborgs determined to find and terminate young John. Powerful revelations, breathless pursuits and bravura effects of The Complete Seasons One and Two create a high-tech action arsena..
Arnold Schwarzenegger returns to his most iconic role as an advanced cyborg from the future in the most successful sequel of all time. It has been 10 years since the events of Terminator. Sarah Connor's ordeal is only just beginning as she struggles to protect her son John, the future leader of the human resistance against the machines, from a new terminator, sent back in time to eliminate John Connor while he's still a child. Sarah and..
James Cameron's epic action, sci-fi masterpiece starring Arnold Schwarzenegger in his most iconic role, has been stunningly restored by Cameron himself. First hitting our screens in 1991 with ground-breaking special effects, this version will takes the seminal blockbuster to the next level of effects and into the 21st century for a new generation of fans. It has been 10 years since the events of Terminator. Sarah Connor's ordeal is onl..
Over a decade has passed since John Connor (Nick Stajl) helped to save mankind from mass destruction. Now 22, Connor is faced with the threat of the most sophisticated cybord killing macjine yet, the T-X. Connor's only hope for survival is the Terminator (Arnold Schwarzenegger), his mysterious former assassin. Together, they must triumph over the T-X (Kristanna Loken) and forestall the looming threat of Judgement Day. Special Features ..
Over a decade has passed since John Connor (Nick Stahl) helped to save mankind from mass destruction. Now 22, Connor is faced with the threat of the most sophisticated cyborg killing machine yet, the T-X. Connor's only hope for survival is the Terminator (Arnold Schwarzenegger), his mysterious former assassin. Together, they must triumph over the T-X (Kristanna Loken) and forestall the looming threat of Judgment Day. Special Features D..
New Mission, New Threat, New Fate. "Enjoy an explosive ride through time" 'in this new chapter of the blockbuster Terminator franchise. In the war of man against machine, Sgt. Kyle Reese is sent back to 1984 by resistance leader John Connor to protect his young mother, Sarah Connor. However, this time unexpected events have altered the past and threaten the future for all mankind. Now Reese, (Jai Courtney, The Divergent Series) must joi..
“Enjoy an explosive ride through time,” in this new chapter of the blockbuster Terminator franchise. In the war with man against machine, Sgt. Kyle Reese is sent back to 1984 by resistance leader John Connor to protect the young mother, Sarah Connor. However, this time unexpected events have altered the past and threaten the future of mankind. 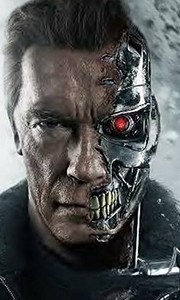 Now Reese, (Jai Courtney, The Divergent Series) must join forces with Sarah (Emilia Clarke, Ga..
Own The Terminator - Endoskeleton Mug from Deff, DVD, Blu-Ray & 4K Video Specialists - Free UK Delivery..
Own The Terminator - I'll Be Back Mug from Deff, DVD, Blu-Ray & 4K Video Specialists - Free UK Delivery..
Own The Terminator - I’ll Be Back Arnie Mug from Deff, DVD, Blu-Ray & 4K Video Specialists - Free UK Delivery..
Arnold Schwarzenegger stars as the most fierce and relentless killing machine ever to threaten the survival of mankind! An indestructible cyborg - a Terminator (Schwarzenegger) - is sent back in time to kill Sarah Connor (Linda Hamilton), the woman whose unborn son will become humanity’s only hope in a future war against machines. This legendary sci-fi thriller from pioneering writer/director James Cameron, written with Gale Anne Hurd, ..
Arnold Schwarzenegger is programmed for action as the most relentless killing machine ever to threaten mankind in this iconic sci-fi thriller! In 2029, giant supercomputers dominate the planet, best on exterminating the human race. As part of their scheme, an indestructible cyborg - a Terminator - is sent back in time to kill Sarah Connor (Linda Hamiliton), whose unborn son represents man's only hope. Can Connor protect herself from the..
Own Terminator 2 DVD from Deff, DVD, Blu-Ray & 4K Video Specialists - Free UK Delivery..
New Mission, New Threat, New Fate. "Enjoy an explosive ride through time" in this new chapter of the blockbuster Terminator franchise. In the war of man against machine, Sgt. Kyle Reese is sent back to 1984 by resistance leader John Connor to protect his young mother, Sarah Connor. However, this time unexpected events have altered the past and threaten the future for all mankind. Now Reese, (Jai Courtney, The Divergent Series) must join..